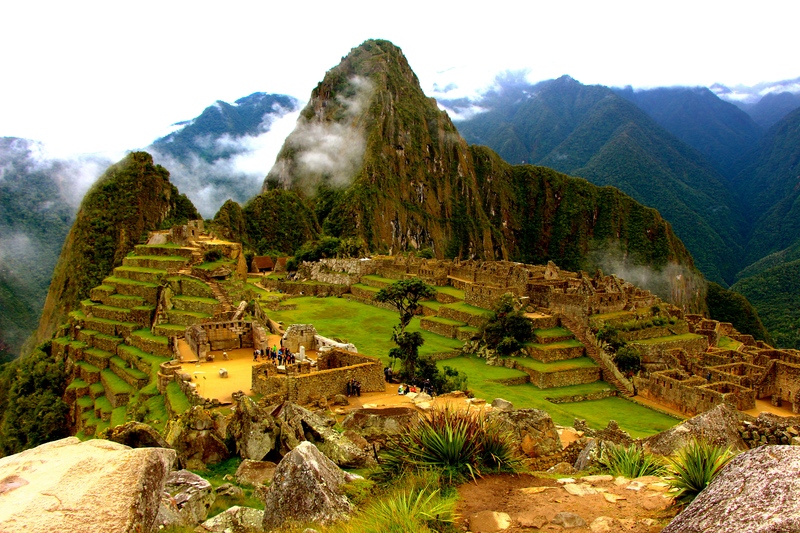 Machu Picchu!! The Poor Man’s Adventure Trek. 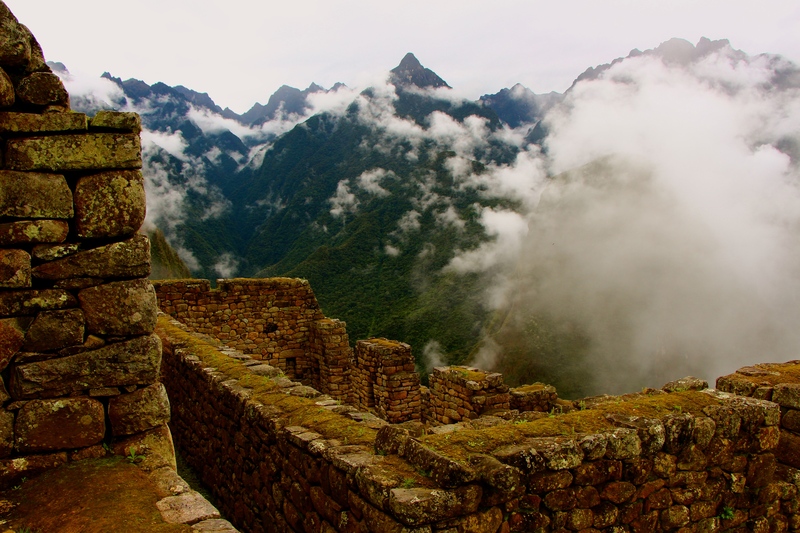 As you might have already guessed, I enjoy the wilder side of things… and so when it came to visiting Machu Picchu I was on the search to find a more “exotic” route to take. 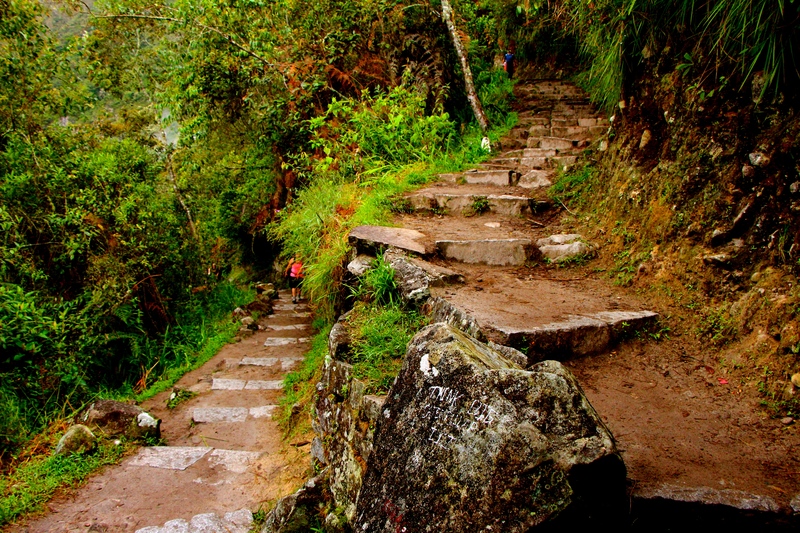 Rather than the much traveled and quite pricey (but phenomenal and classic) Inca Trail, I booked the more economical Inca Jungle Trek. 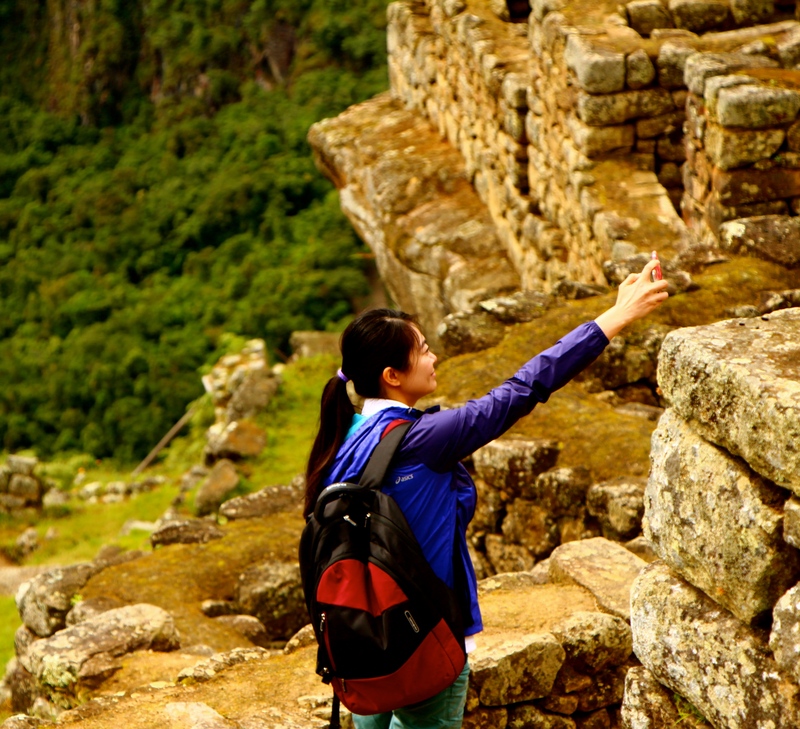 What not everyone knows is that there are actually two trails traveled by the Incas to get to Machu Picchu, well technically one wasn’t traveled by the “Inca” because Incas were actually just the royalty or ruling class. 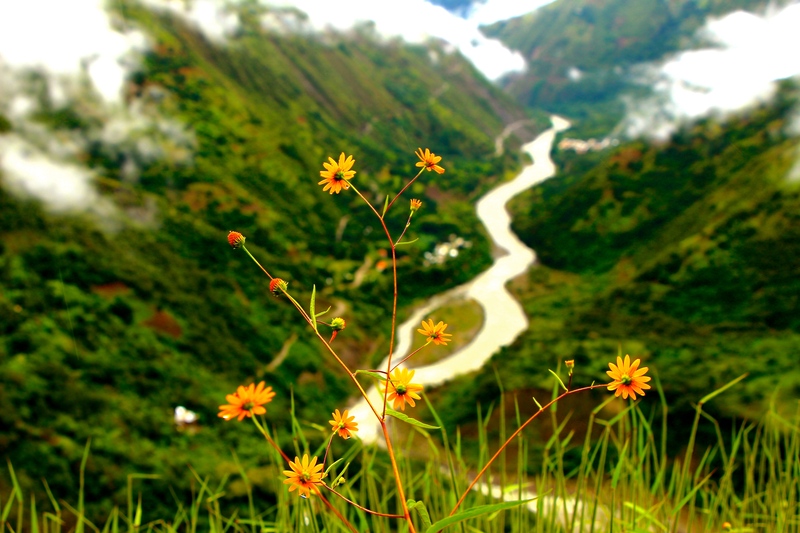 The commonly known trail is the route the royalty took to reach Machu Picchu, but the common people or Quechua people took a route through the Andean jungle. 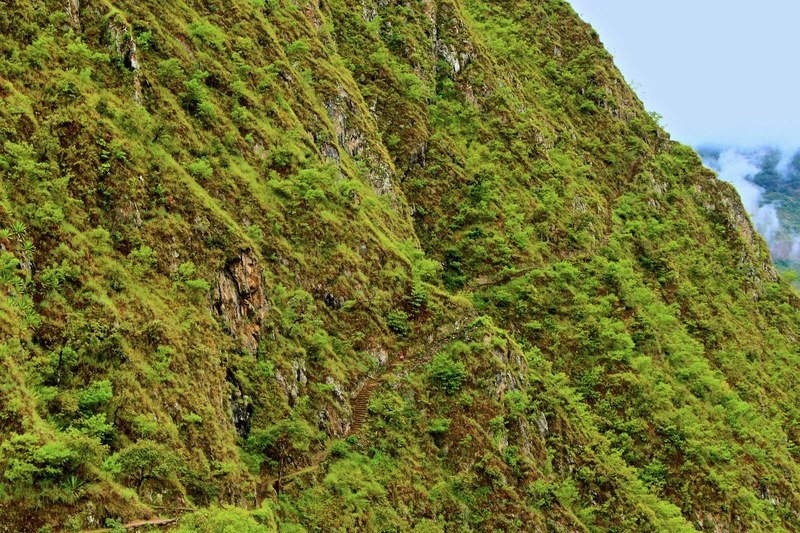 This isn’t a beautifully crafted stone walkway like the images conjured by the mention of the Inca Trail, it’s a winding overgrown footpath through the thick of the jungle. 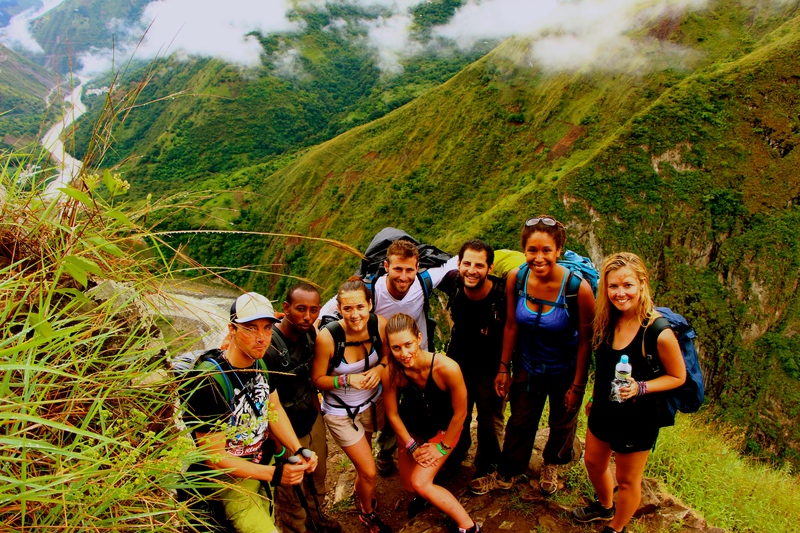 To go on this wild adventure with a tour company, there are usually 3 and 4 day options offered, but to do it as cheap as possible yet still have enough time to explore I chose a 5 day plan that was all walking and buses… rather than enjoying the comfort of taking the train. 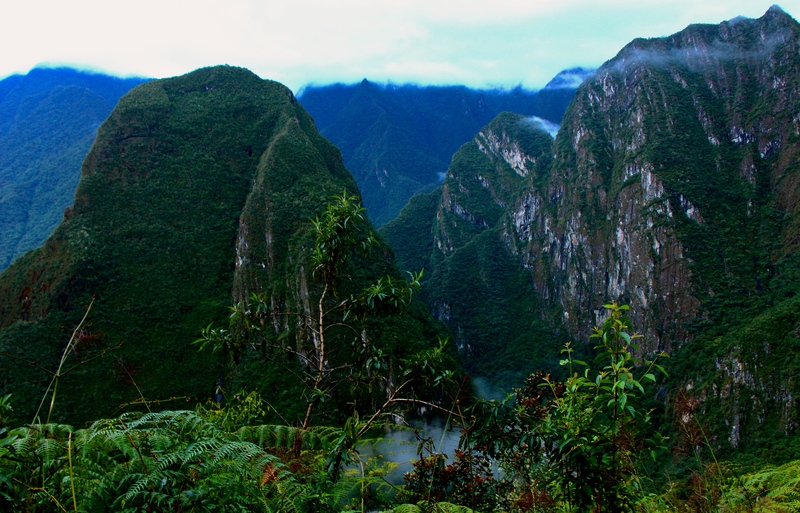 The first day consisted of a thrilling and slightly terrifying mountain bike ride down from a peak in the Andes into the jungle below, with the option to go whitewater rafting in the valley for an extra $30. The second day was a 6-8 hour hike straight up and over a mountain then ending the day in a natural hot springs. The next morning there was another $30 option to go zip-lining and then take a car to the town of Hydro Electrica, if you don’t go with that option you do save 30 bucks… but you have a 4 hour hike bright and early to get to Hydro Electrica in time to meet up with the zip-lining crew. 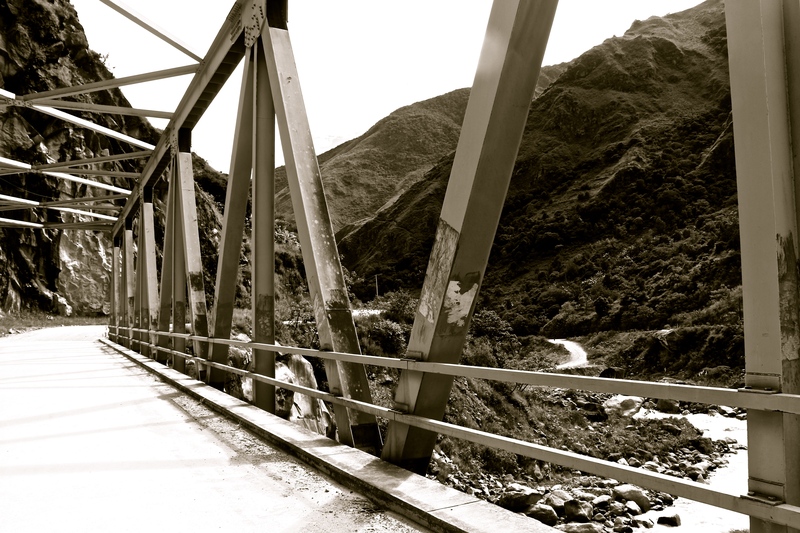 After having lunch together at Hydro Electrica, everyone does the 3 hour hike along the train tracks to the town located below Machu Picchu, Aguas Calientes (or as it is now being called… Machu Picchu Pueblo). The next morning at 5am pretty much the entire town begins the 2,000-step climb to the top. 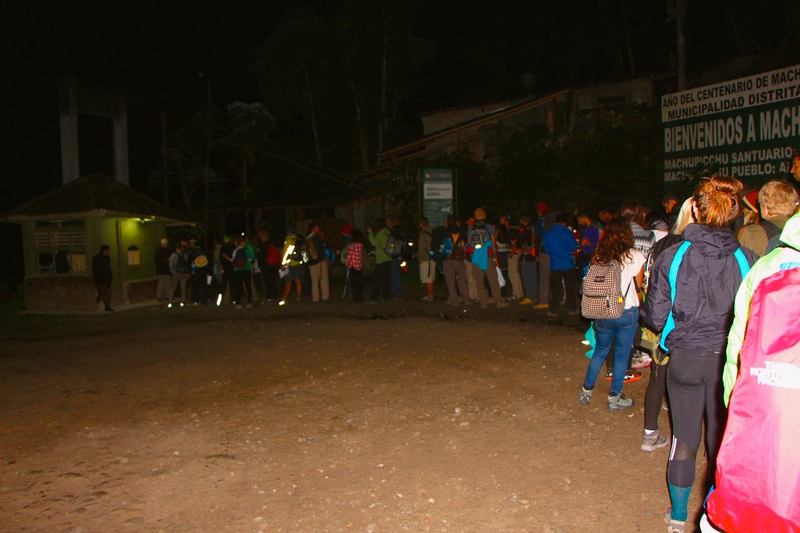 Once at Machu Picchu, halfway through the day most people doing the jungle trek have to leave and hike the 3 hours back to Hydro Electrica in order to catch their 3pm bus to Cusco, the lucky ones take the train that night. I didn’t want to sacrifice a second of sunshine at the top, and I could barely walk after 4 days of hiking nonstop, so I spent one extra night in Aguas Calientes and slept in before my 3 hour hike to catch my 6 hour bus back to Cusco. 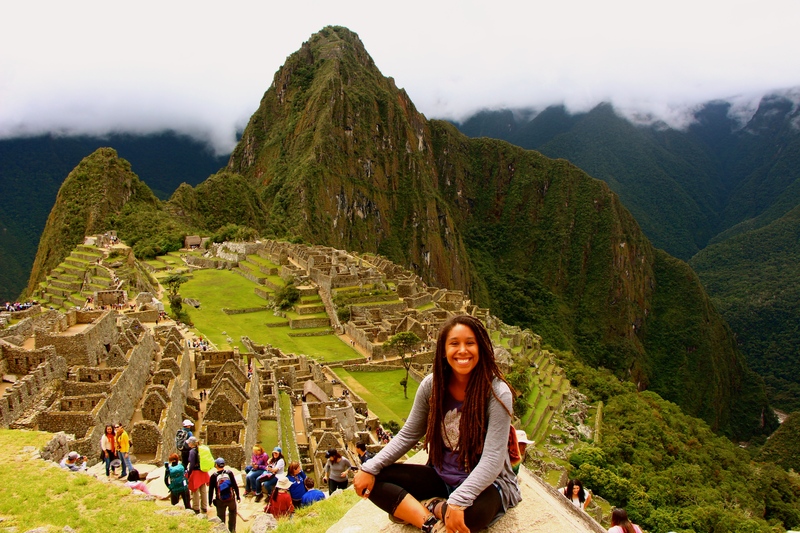 I went on this incredible trip my last week in Peru with the last of my funds… and so I opted for the most basic plan, which was mountain biking, hiking, hot springs, and a visit to Machu Picchu!! 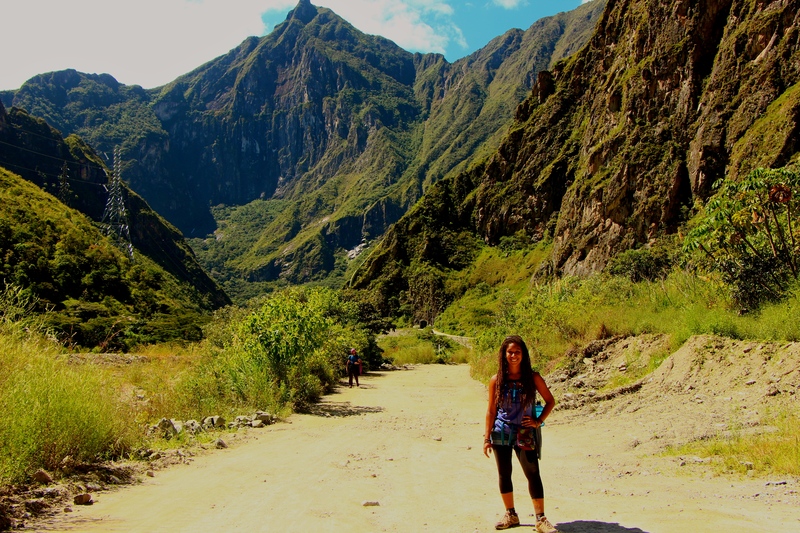 The company I used was called Aita Peru, the woman running it was amazing and thorough… tailoring the trip to the individual needs of every person (I highly recommend them as I shopped around a lot beforehand and was so happy with my decision). 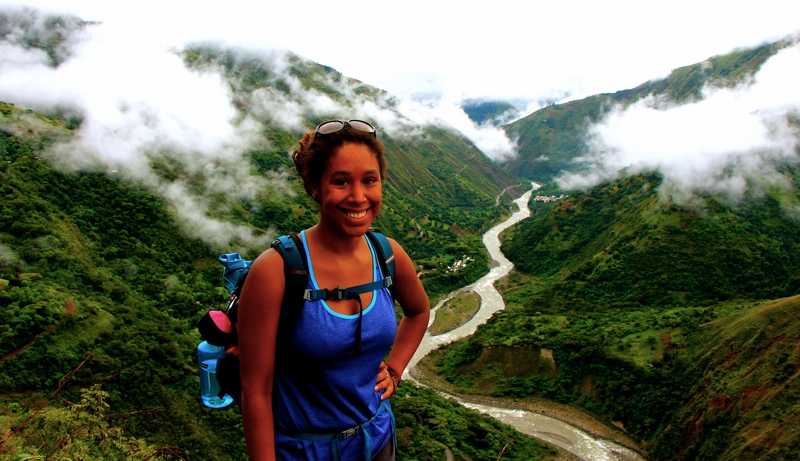 I couldn’t have asked for a more adventurous, inspiring, and motivating end to my journey through Peru. The bike ride was by far the most adrenaline-junkie part of the trek. We got all geared up and then went barreling down a mountain road for two and a half hours. My heart would feel like it was going to explode every time I was passed by a bus or construction vehicle while making a hairline turn on one of the many switch backs. Starting up at 4,000 m above sea level where I had wished I put another layer on under the odd “biker” jacket we were supplied with, we ended the ride in the valley surrounded by lush jungle and I couldn’t wait to strip down to my tank top. The most amazing part for me (being more of a naturalist than a crazy thrill chaser), was the incredible change in foliage over the 2.5 hour ride… and being able to see the way the plants have adapted to a completely different environment all on the same mountain! The following day we set out on the toughest hike, up and over a mountain. 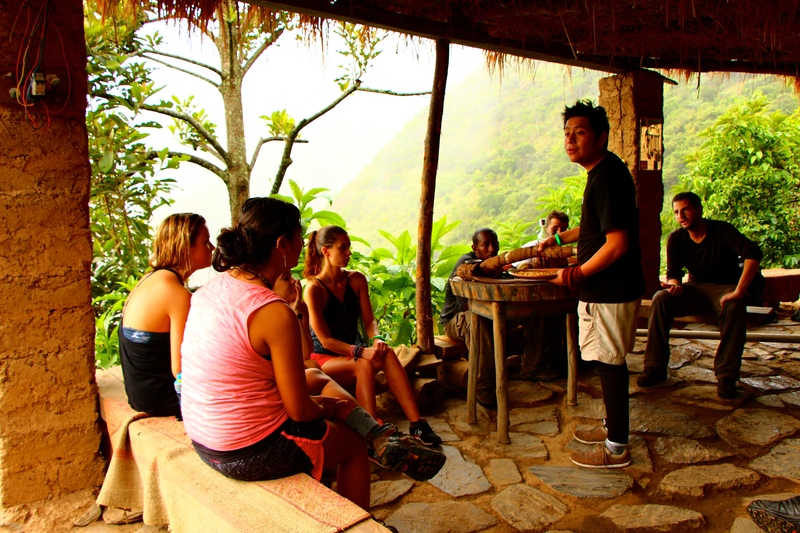 During the hike we stopped at the Monkey House, which was a working coffee plantation where tours can stop for a break and learn about cacao, coffee, and coca. We marched on after that delightful break, over rickety bridges, back and forth along insanely narrow switchbacks, and ended in the hot springs! Our guide Junior giving us a lesson on jungle crops. 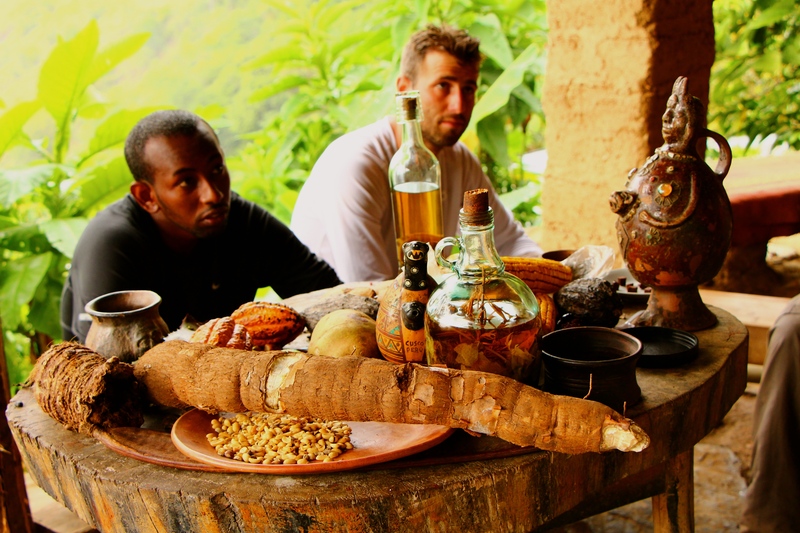 Yucca, fresh coffee beans, jungle liquors, cacao beans, and purple corn! That silver bunch of buildings by my elbow… yeah I came from somewhere near there that morning. BAMF-status! My companions for those glorious 5 days. 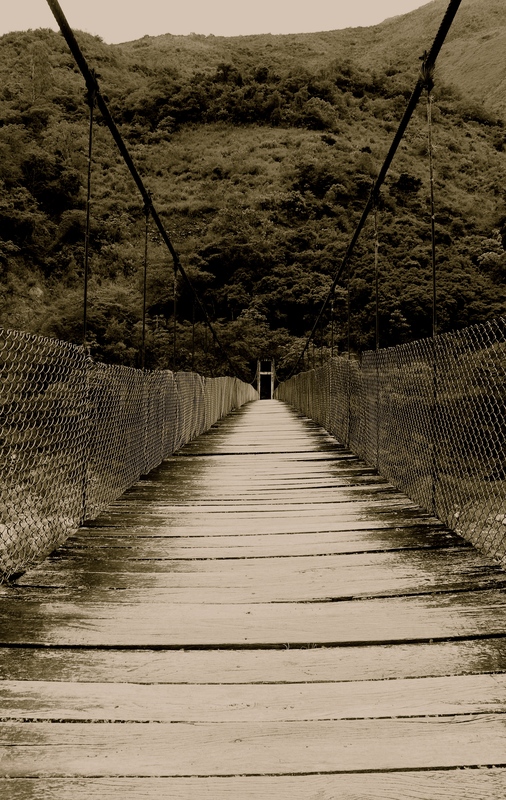 Rickety Bridges… not for the weak of heart! 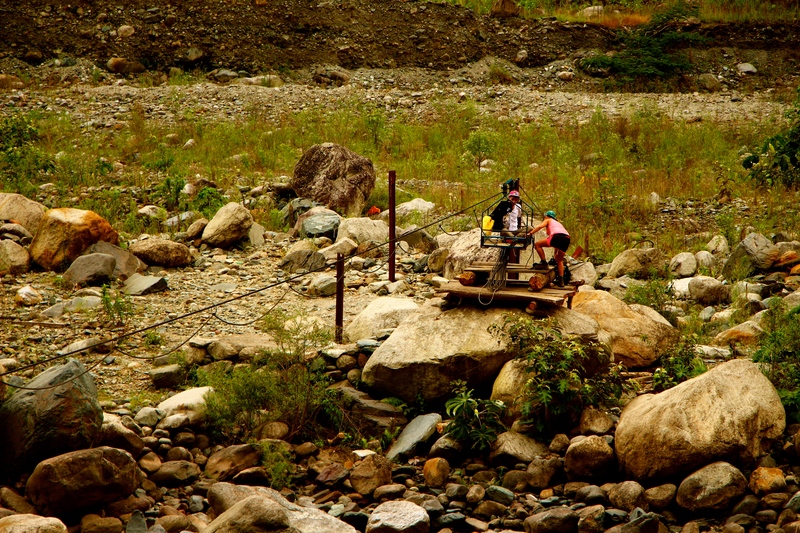 Nothing like a bucket pulley over a raging river. The third day only two of us opted out of zip-lining in the morning, and so we were each other’s hiking buddies for the first 4 hours of the day. Our guide stayed with the other six and drew us a crude map that looked like something you would follow to get to Narnia… “You go down this ladder, around the mountain, over this bridge… there will be a guard then blink twice say my name and you’ll be there”… ok not quite that weird but pretty close. It’s a shame the other 6 people got to take a car for this section of the trip because that 4 hour hike was truly beautiful! 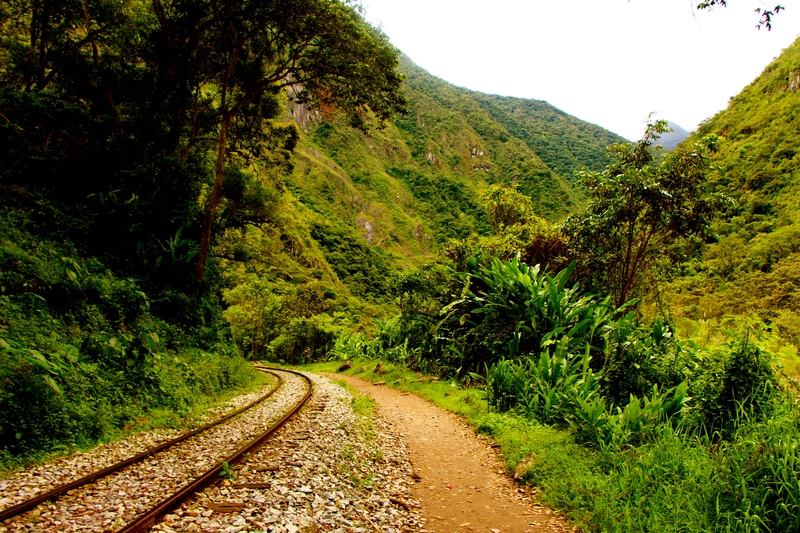 After lunching all together, we finished the day with a 3 hour walk along the train tracks to finally reach the town of Aguas Calientes. Gorgeous bridge in the valley surrounded by awe-inspiring mountains. 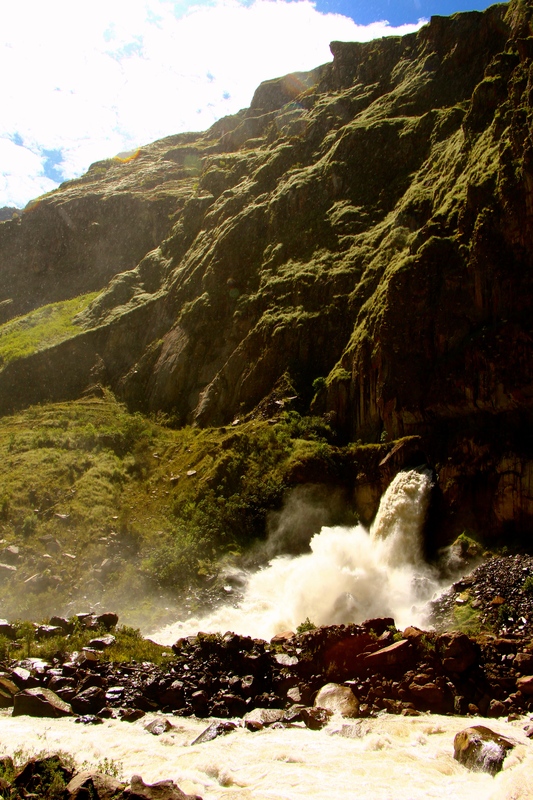 Beautiful waterfalls showered the mountainsides. 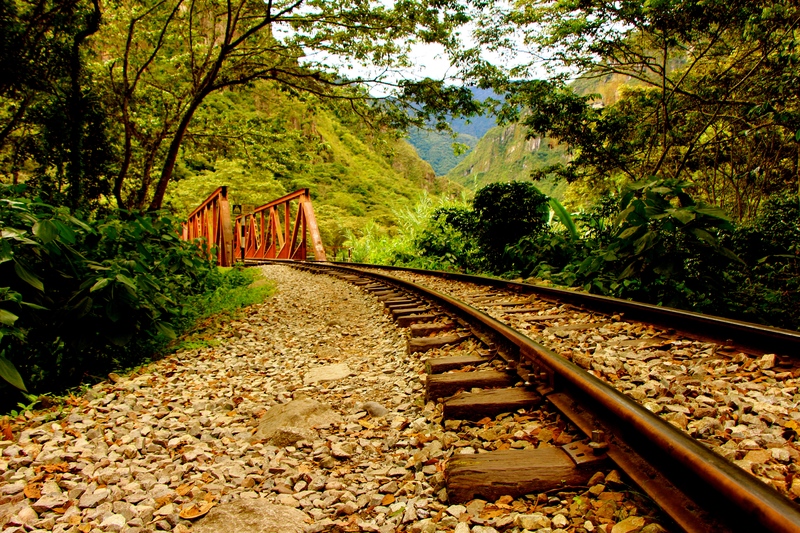 Train tracks to Machu Picchu. As I was grumbling about the pain in my legs… getting this shot made me remember how good it is to be on foot instead of rushing past in a train. The next morning at 5am, I pretended that every inch of my body was NOT in pain, and I jumped out of my bed like it was Christmas! 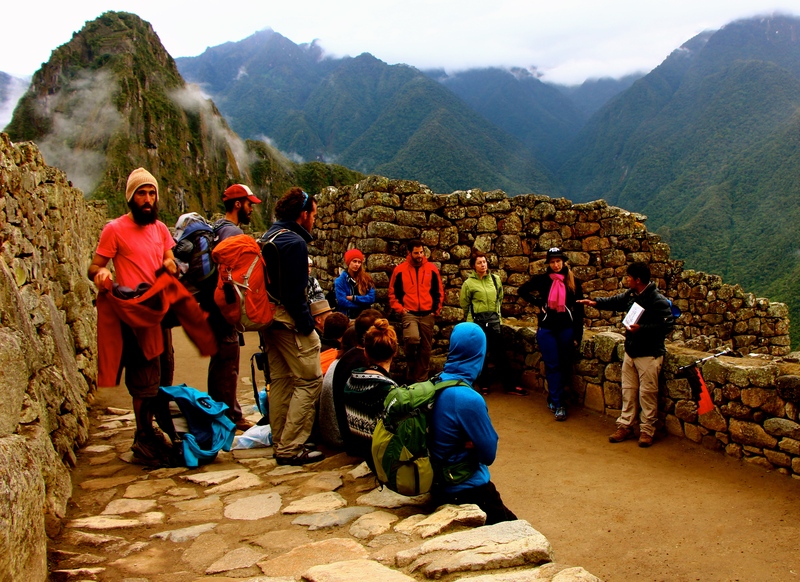 I headed to the line and waited my turn at the bottom of Machu Picchu to get my ticket checked. When you look up it seems to be a sheer cliff face, and you can’t possibly imagine how anyone… let alone little asthmatic me… could get to the top. Then I did it! I hiked up those nearly vertical 2,000 steps huffing and puffing, but I made it!! Waiting in the line at 5:30am to get let across the bridge to begin the hike up. Hiking up 2,000 steps, and as the sun began to rise… it was so obvious how it was worth every bit of pain in my aching body! 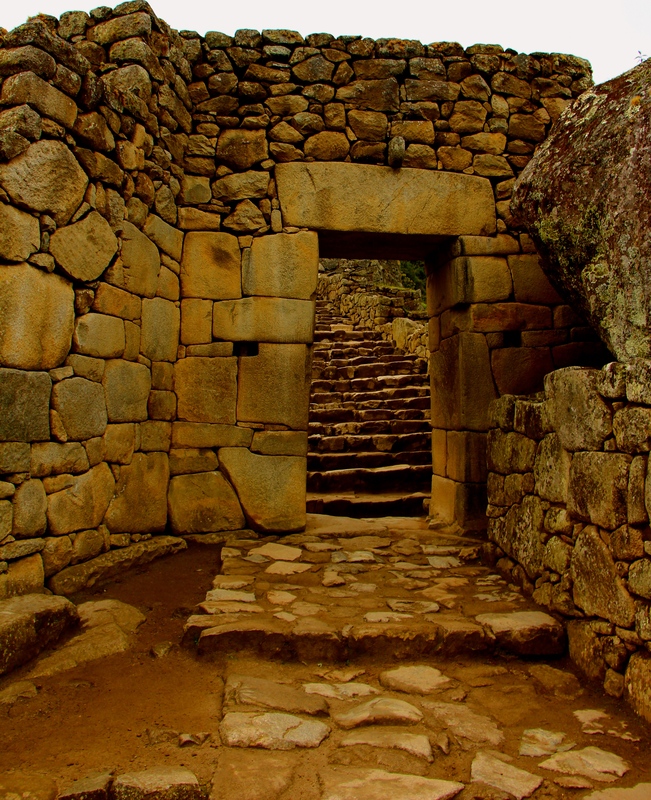 Beautiful steps made by the Quechua people, during the time of the Inca empire. 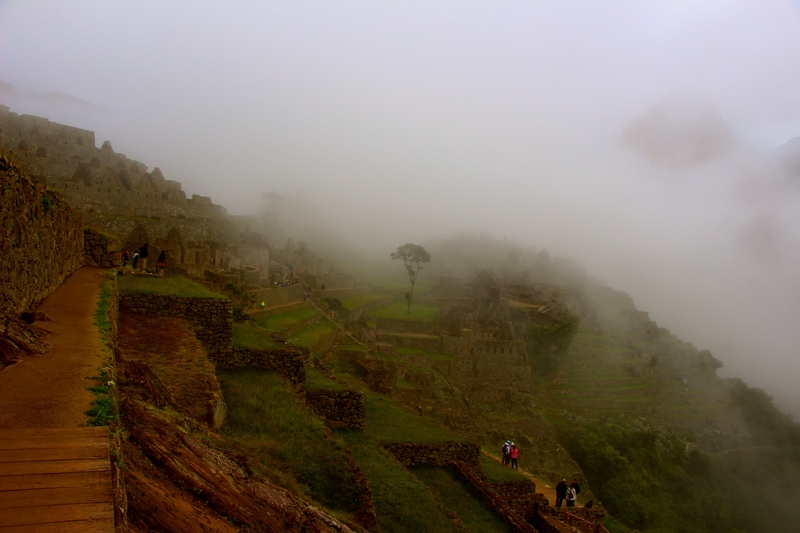 Finally up at the top and through the gates, Machu Picchu is still clouded by the morning mist. Amazing doorways that have lasted the test of time. Before we went off to explore on our own, we walked around for 2 hours with a guide who explained the history of this incredible site. 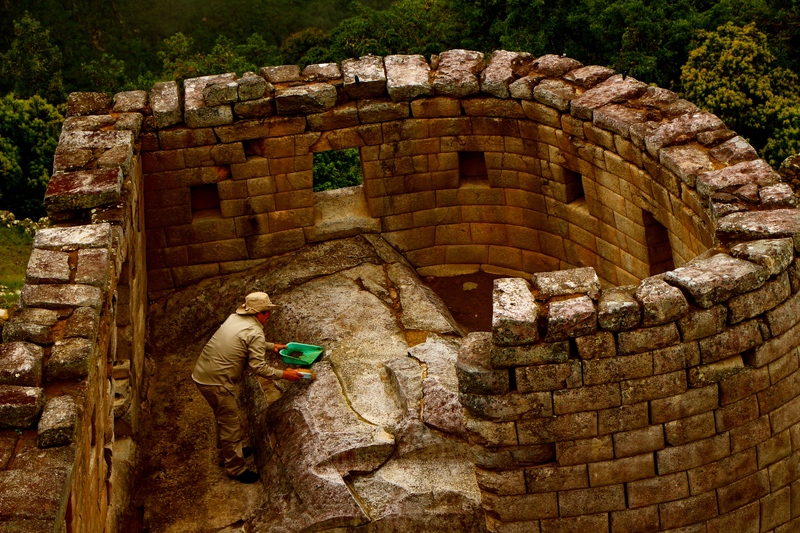 The only building with a rounded wall… believed to be a temple of the sun. 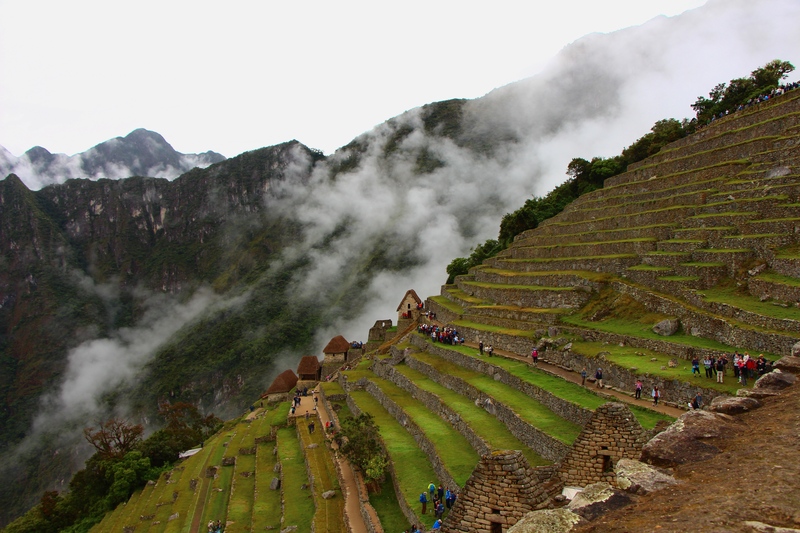 It is thought that this was an architectural design to keep Machu Picchu from sliding off the top of the mountain, but another theory is that they were used for agriculture… and some say these terraces were for both. “Don’t touch the ruins!” Im not touching… I’m thinking! Don’t forget me! 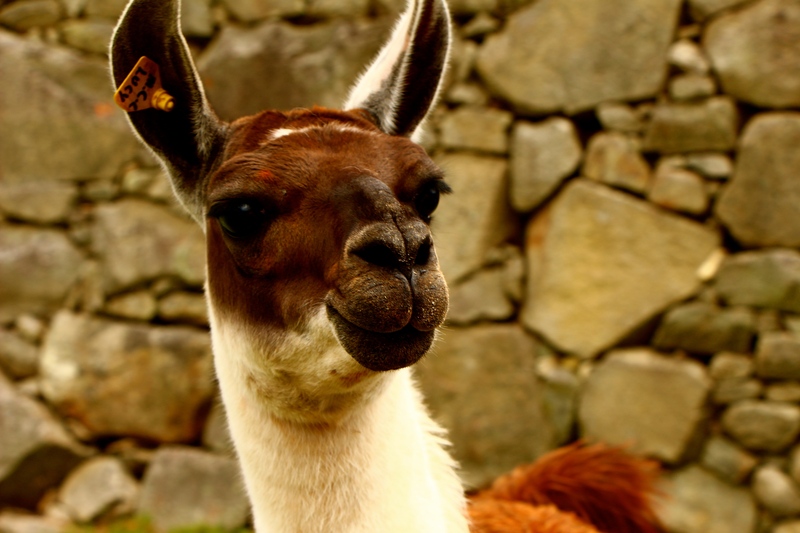 The llamas at the Machu Picchu site are actually there to maintain the grass! 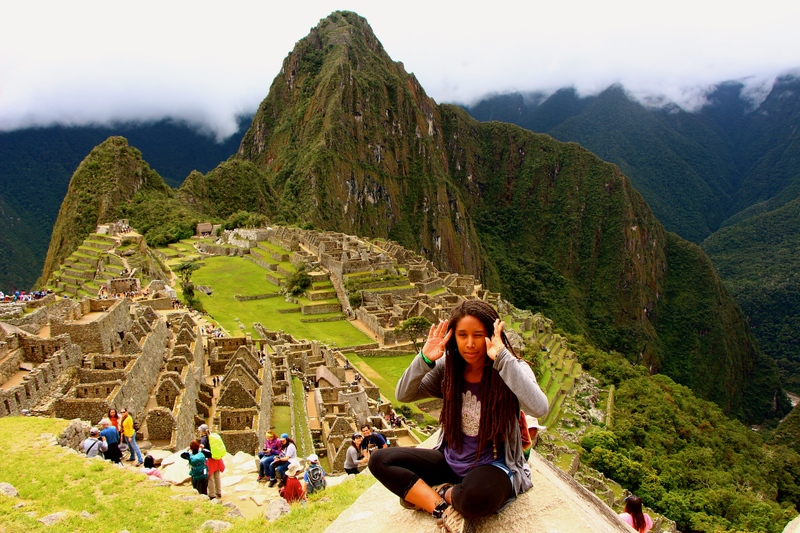 Channeling the essence of the Picchu… actually I was fixing my hair for the pic, but meditating makes it seem like I’m making a much cooler face! This was one of the most incredible things I have done in my life. 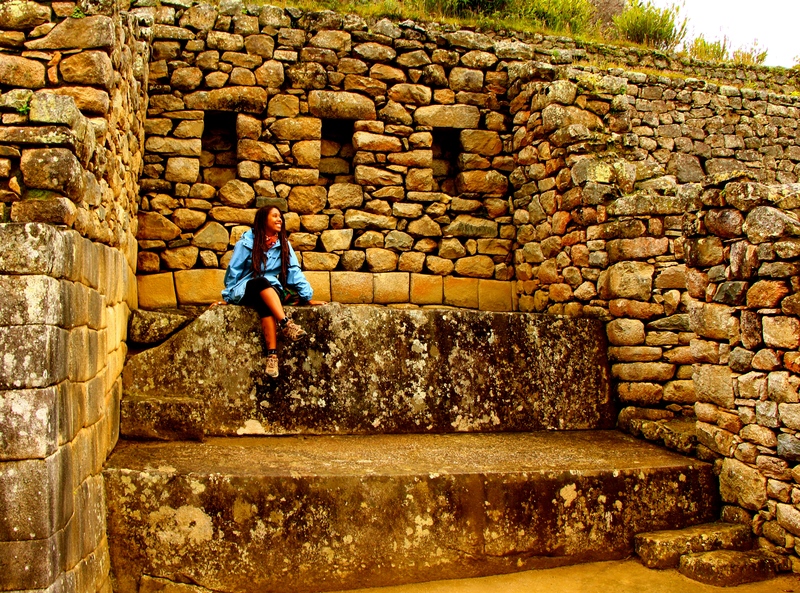 I made memories and friends I get to keep forever by going through the amazing tour group Aita Peru, but I still had that time I need when I visit a place to sit and be with just myself. I like to say that when I travel I never “sight-see”… I commune. 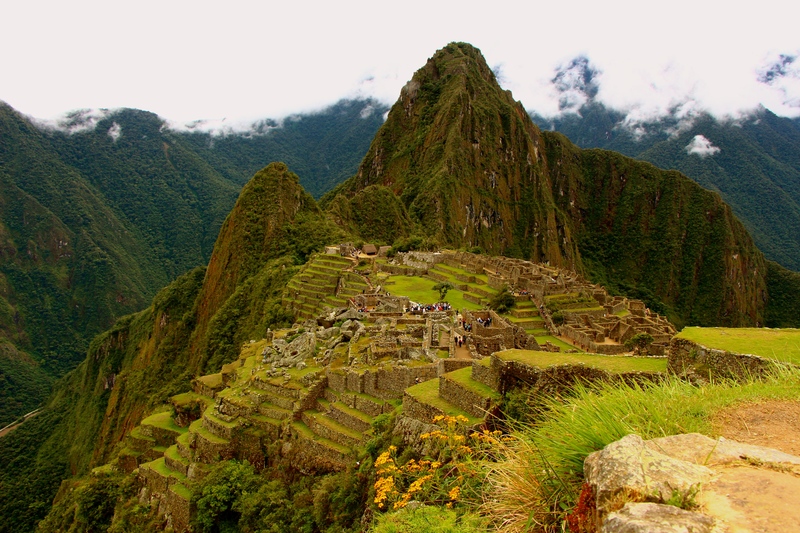 Machu Picchu proved to be one of those incredible places where as I stand in awe, my soul expands to connect with the land and I am forever changed… elevated and never to be the same.